In emergency situation it would be practically important to trace an object carriing an aprs tracker somewhere, and send telemetry data to the aprs network. To receive this data possible with the outernet downlink where arenot aprs network or any other possibilities to receive this type of data. Based on our “floating buoy on Danube” project, I made a small experiment to route some telemetry packets through the outernet network to my Dreamcatcher receiver. In our experiment we use reprogrammed Vaisala meteo sonde as balloon/aprs tracker. We put this devices in a waterproof box, and it is floating on the Danube river. It functioning as a ready-to-fly balloon tracker as-well. It use the standard radio amateur 432 MHz aprs frequency, and another 430 Mhz frequency for rtty telemetry in balloon/ukhas format. We havenot aprs iGate-s on this frequency nearby the riverside, so, to our experiments we build “mobile” receivers/igate" units to follow the floating object. One is based on rtl-sdr and RPi2, another is running on laptop for use in car. This units use 3G gsm network to send the data to the aprs network, but, ofcourse possible to use another radio amateur channels to send the telemetry data. Bob Bruninga described the most advanced mode with WSPR, but it can be used the HF aprs network too. Now in a small experiment I pushed 9 aprs telemetry packet to the aprs network with one of our “mobile” igate setup addressed the packets to OUTNET. In the last data block, started with /P there ara some minimal sensor data: P = packet counter, S = numbers of gps sat, receoived by the tracker unit, T = temp of the controller unit, V = the Voltage level on battery. /P4, 6, 8, 10, 12, 14, 16, 18, 20. It need more investigations, where the packets lost. This is totally interesting, I would love to here more about this . in this time I can receive only 5-6 hours continuosly, because my accu pack capacity. Yesterday, after sent the aprs packets to the aprs network, I have receive conditions no more than 2 hours. A heavy raining hit my place, and I stopped the system immediatly, because it has only temporaly waterproof cover. So, this is why on my receive list there are only 5 received packets. There are local times, CET. The delay are different, but the last case with P20 was “immediately” and with the previous packets were 2-4 minutes. I took screenshots about this small aprs activity, apeared on aprs.fi map. Here is one. You can find this map and the raw packets, searching on the aprs.fi site use the DUNA3* keyword, and choose the raw packet to see the data. If you zoom to street level you can see some moves of the “balloon” object: it come from the GPS data error, or “tolerance”. The “temporaly” , mobile iGate call is HA5KFU. Tagging @Abhishek and @zoltan because this is an incredibly interesting project. Keep it up! Two yerar ago we started to deal with amateur, pico (floating) ballooning. In the last summer we decided to collect some practices arund the larger amateur balloons, carriing camera, and we interested specially the recovery processes. We concluded, there are everyday event the meteo sonda/balloon flights, we need only follow them and start to find each of them. In half a year we collected significant amount of them, different modells, mainly produced by finnish company, Vaisala. It become clear, the latest model, RS41 is a very good, sophysticated design, has good quality GPS modul, and recent digital radio chip from SiliconLabs. This devices developed one-flight-only, dont want to recover them. During the flight they transmit the sensors data on the dedicated frequency for meteorological measures, on 400-405 MHz. We found, some polish developers started to reprogram this devices, to use 430 MHz ISM band and radio amateur frequency. This device is ready-to-use as amateur balloon paylod too. But it 4 x times heavier, as the amateur payloads, flying on pico balloons. Consequently to fly need larger balloon, more helium, and more money… we decided to search another way to use this devices. In our capital city flowing through the Danube river, we decided to put on the water this telemetry devices. On the riverside located our technical university, BME, with the building, top of it our satellite ground station. The main antenna is a 4 m parabola, was ready in springtime. We decided, to test its remote-control mode try to foloow our floating bouy in the city. For this purposes was developed a small rtty decoder program running on RPi, and produce and upload the coordinates of the buoy to the ground station,s control unit. The river in the city is 3-400 m wide, but has in the center heavy ship-traffics, and of course, the path of the buoy infulenced with wind in different directions. To study the real path, we started some test buoys… We put the real experiment with the telemetry payload into the middle of the river, and we followed it on public transport on the riverside. At the south bridge there are some ships fixed to the strand. Edge of this objects, cumulated some garbadge, mainly trees, floating on the water. On this small dump stopped our buoy, become horizontally, laying on this garbadge. We get help from the people on the ship to free it, but this small time was enough to go into some water on a small hole, which on the floating wasnot in the water. The electronic stopped to transmit anymore. It continues the trip more 6-7 km, and finally after the city boarder, on a private territory on the water company, a man found it on the riverside. Inside was a message, and he sent me a mail, and we got back the device. It was intresting to investigate the demages on the electronics, because the relative short time was cover with water. All the trip was 15 km long, in half path we had the possibilities to receive the telemetry ftom it, so it was successfull experiment. We collected some nice idea, to improove the design, to use more effects, to able follow it in visible, maybe with online webcams, or produce active light effects, and so. We plan some more start too, but in summertimes the reiver is “very busy” with different public, sports, turist events. In this moment, I dont know what will be a “real situation”, when this or similar devices and setup become practically usefull or helpfull, but it seems, it would be good to invetigate the possibilities. 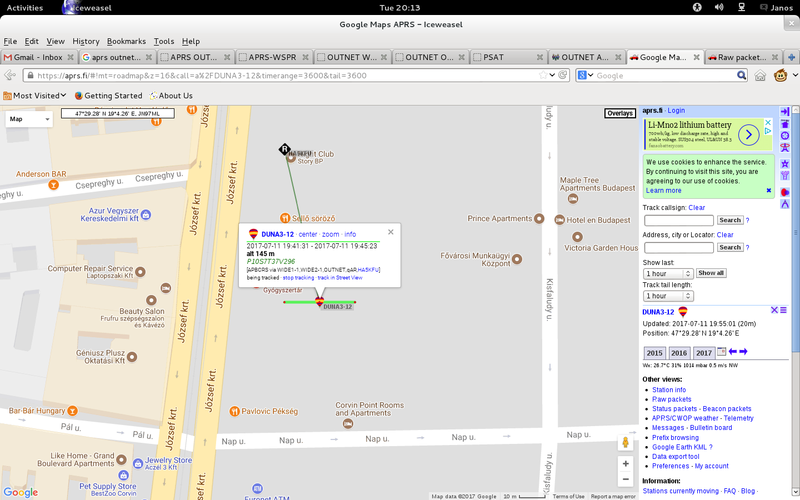 How are you reviewing the aprs message logs? I can individually open each txt file in the file manager, but I’m not smart enough to search or sort the downloaded files. I either rightclick to open with textpad or use the ‘download to computer’ for each file… I can’t make it look at the whole downloads:///Amateur Radio/APRS/APRSAT folder. Login with outernet username and pw. I want to restart this project. I’m taking a road trip to the south west corner of Virginia across the Easter weekend (about a 10 hour drive from here). Based upon previous trips I know that there are significant holes in the APRS network but I think it would be an interesting experiment to see where the holes are, whether or not there are any Igates along the route and how closely my RF track matches that of my cell phone app? I need a little guidance as to how many positions per hour would be tolerated by the current system. I’m also unsure of how one would pull the downlinked positions into a mapping application?